Download "White Paper March 2009. 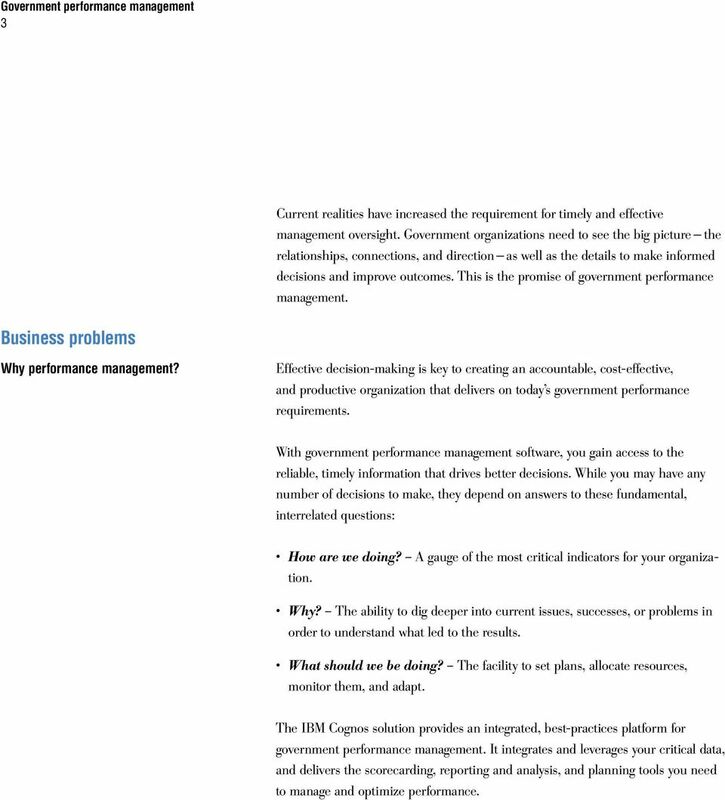 Government performance management Set goals, drive accountability and improve outcomes"
2 2 Contents 3 Business problems Why performance management? 4 Business drivers 6 The solution Improved performance with IBM Cognos solutions Scorecarding Reporting and analysis Customer success: U.S. Coast Guard Planning and budgeting 11 Conclusion Abstract Accountability demands on the public sector increase every year, so government agencies are always seeking new ways to improve and report on their performance. 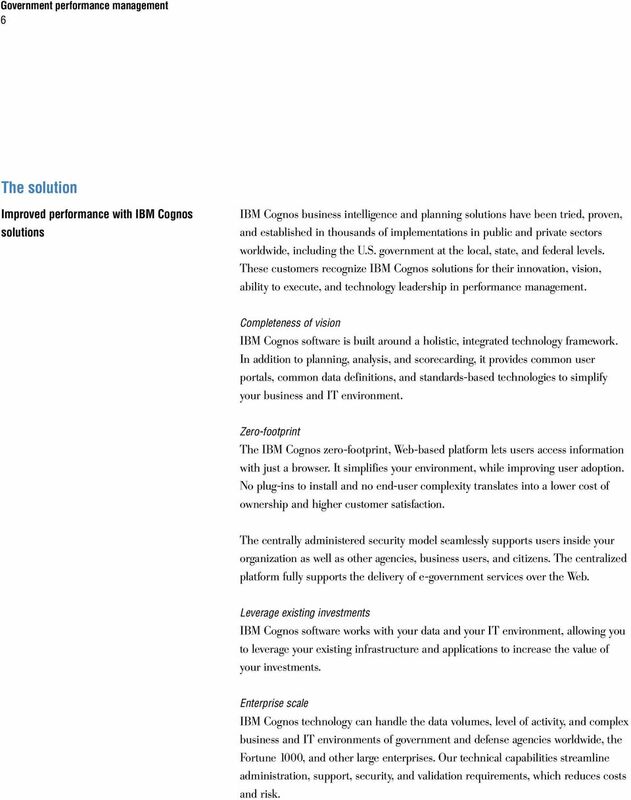 IBM Cognos performance management solutions can help, with features such as advanced planning, scorecarding and reporting tools that are ideally suited to government. 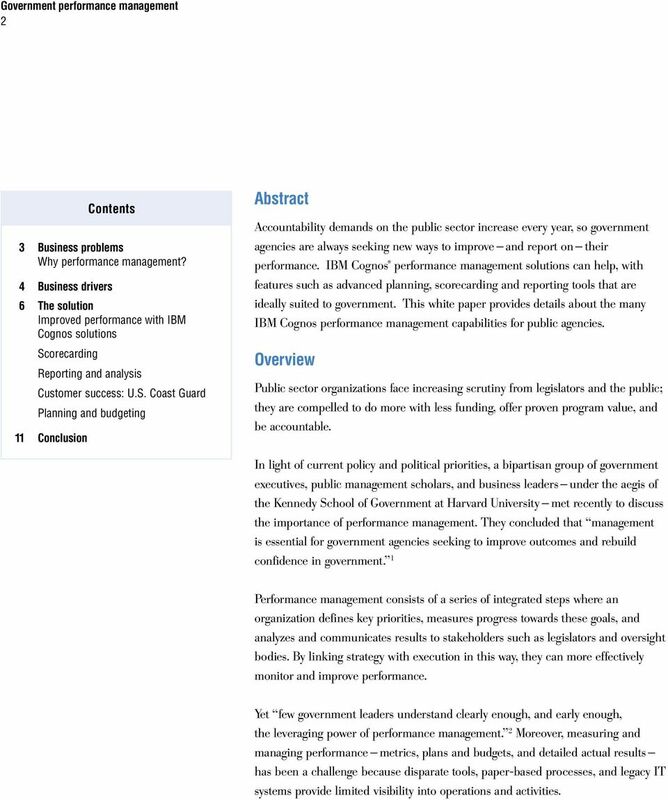 This white paper provides details about the many IBM Cognos performance management capabilities for public agencies. Overview Public sector organizations face increasing scrutiny from legislators and the public; they are compelled to do more with less funding, offer proven program value, and be accountable. In light of current policy and political priorities, a bipartisan group of government executives, public management scholars, and business leaders under the aegis of the Kennedy School of Government at Harvard University met recently to discuss the importance of performance management. They concluded that management is essential for government agencies seeking to improve outcomes and rebuild confidence in government. 1 Performance management consists of a series of integrated steps where an organization defines key priorities, measures progress towards these goals, and analyzes and communicates results to stakeholders such as legislators and oversight bodies. By linking strategy with execution in this way, they can more effectively monitor and improve performance. Yet few government leaders understand clearly enough, and early enough, the leveraging power of performance management. 2 Moreover, measuring and managing performance metrics, plans and budgets, and detailed actual results has been a challenge because disparate tools, paper-based processes, and legacy IT systems provide limited visibility into operations and activities. 3 3 Current realities have increased the requirement for timely and effective management oversight. Government organizations need to see the big picture the relationships, connections, and direction as well as the details to make informed decisions and improve outcomes. This is the promise of government performance management. Business problems Why performance management? Effective decision-making is key to creating an accountable, cost-effective, and productive organization that delivers on today s government performance requirements. With government performance management software, you gain access to the reliable, timely information that drives better decisions. While you may have any number of decisions to make, they depend on answers to these fundamental, interrelated questions: How are we doing? A gauge of the most critical indicators for your organization. Why? The ability to dig deeper into current issues, successes, or problems in order to understand what led to the results. What should we be doing? The facility to set plans, allocate resources, monitor them, and adapt. The IBM Cognos solution provides an integrated, best-practices platform for government performance management. It integrates and leverages your critical data, and delivers the scorecarding, reporting and analysis, and planning tools you need to manage and optimize performance. 4 4 With integrated plans, business intelligence, and performance metrics, you can dramatically improve your understanding of the business, and improve your ability to make timely, informed decisions. 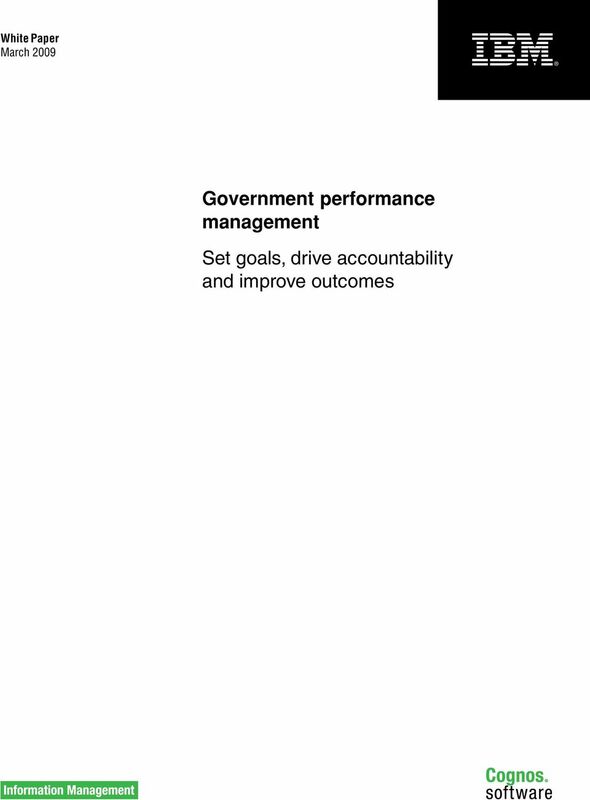 Examples of how government performance management might be used in government agencies. Business drivers Where organizations begin on the path to performance management will differ, and how quickly they implement the platform will vary. The bottom line is that you can take an incremental approach, starting with one performance management component and building from there. Every time you address one element in the system, you strengthen your decision-making and performance. Starting Point 1 The one thing If you were to do one thing to improve your organization s performance, what would it be? For some, it is tracking how and where program dollars are being spent. For others, it is finding better ways to share processes and delivery capacities across agencies. IBM Cognos technology lets you understand the information to do the one important thing, and then grow from there. 6 6 The solution Improved performance with IBM Cognos solutions IBM Cognos business intelligence and planning solutions have been tried, proven, and established in thousands of implementations in public and private sectors worldwide, including the U.S. government at the local, state, and federal levels. These customers recognize IBM Cognos solutions for their innovation, vision, ability to execute, and technology leadership in performance management. Completeness of vision IBM Cognos software is built around a holistic, integrated technology framework. In addition to planning, analysis, and scorecarding, it provides common user portals, common data definitions, and standards-based technologies to simplify your business and IT environment. Zero-footprint The IBM Cognos zero-footprint, Web-based platform lets users access information with just a browser. It simplifies your environment, while improving user adoption. No plug-ins to install and no end-user complexity translates into a lower cost of ownership and higher customer satisfaction. The centrally administered security model seamlessly supports users inside your organization as well as other agencies, business users, and citizens. The centralized platform fully supports the delivery of e-government services over the Web. Leverage existing investments IBM Cognos software works with your data and your IT environment, allowing you to leverage your existing infrastructure and applications to increase the value of your investments. Enterprise scale IBM Cognos technology can handle the data volumes, level of activity, and complex business and IT environments of government and defense agencies worldwide, the Fortune 1000, and other large enterprises. Our technical capabilities streamline administration, support, security, and validation requirements, which reduces costs and risk. 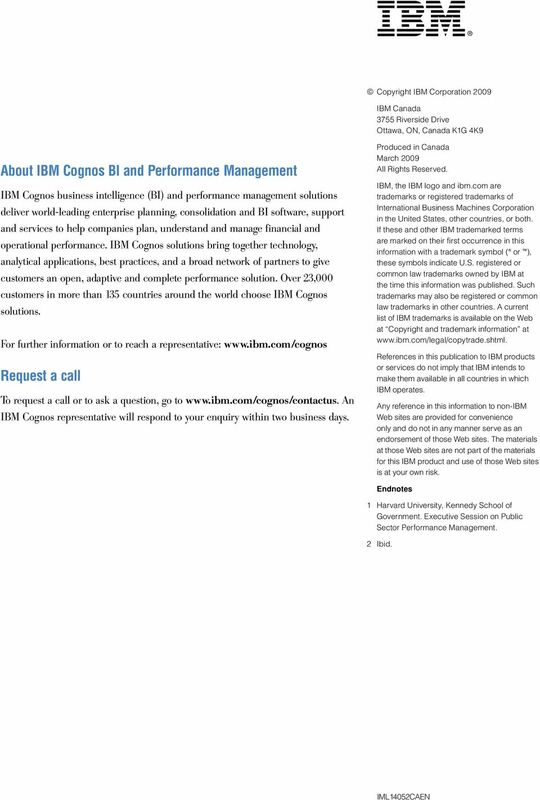 7 7 Award-winning support IBM Cognos Software Services supports our integrated performance management capabilities. We consistently top the list for best software support and services innovation with customers and support professionals. Our consultants can design and implement a solution that grows as your organization grows to deliver value for years to come. Scorecarding Scorecarding with IBM Cognos 8 Business Intelligence communicates strategy and objectives through a metrics-based method of management. It answers How are we doing by providing people with the information they need to take ownership of their performance visibility into strategy, understanding the part they play in making the strategy succeed, and the metrics to measure their success. Scorecarding also allows stakeholders and the public to be educated on what your organization has been charted to do and stay informed of activities. By enabling the strategic alignment of program objectives against performance metrics, you can answer at any time the central questions: Are we on track? Are we making progress on the things that must be done? 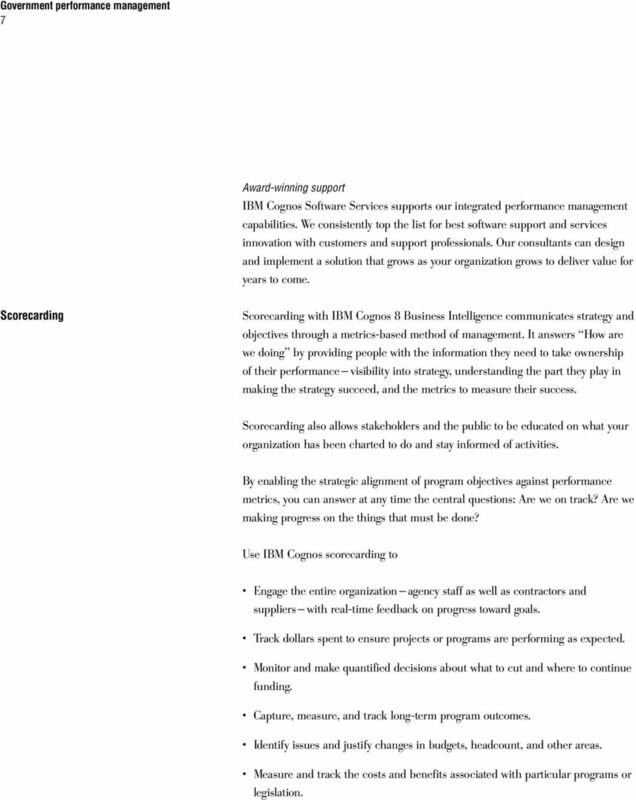 Use IBM Cognos scorecarding to Engage the entire organization agency staff as well as contractors and suppliers with real-time feedback on progress toward goals. Track dollars spent to ensure projects or programs are performing as expected. Monitor and make quantified decisions about what to cut and where to continue funding. Capture, measure, and track long-term program outcomes. Identify issues and justify changes in budgets, headcount, and other areas. Measure and track the costs and benefits associated with particular programs or legislation. 8 8 Reporting and analysis Public sector organizations amass large amounts of data that reside in many systems ERP, CRM, HR, data warehouse often across multiple sites and locations. Consolidating this information is a huge challenge. It is especially difficult given that there can be as many tools used to analyze and report on the data, creating further islands of information. IBM Cognos 8 BI reporting and analysis consolidates and leverages your critical data and turns it into consistent, meaningful information relevant to your organization s mission. You can spot broader trends and drill down to discover underlying causes and issues. The Web-based reporting and analysis environment means people access consistent information delivered in the right way across all departments, roles, and locations. With standardized BI reporting and analysis, you can accurately assess the Why behind performance. This provides the necessary context against which decisions can be made. 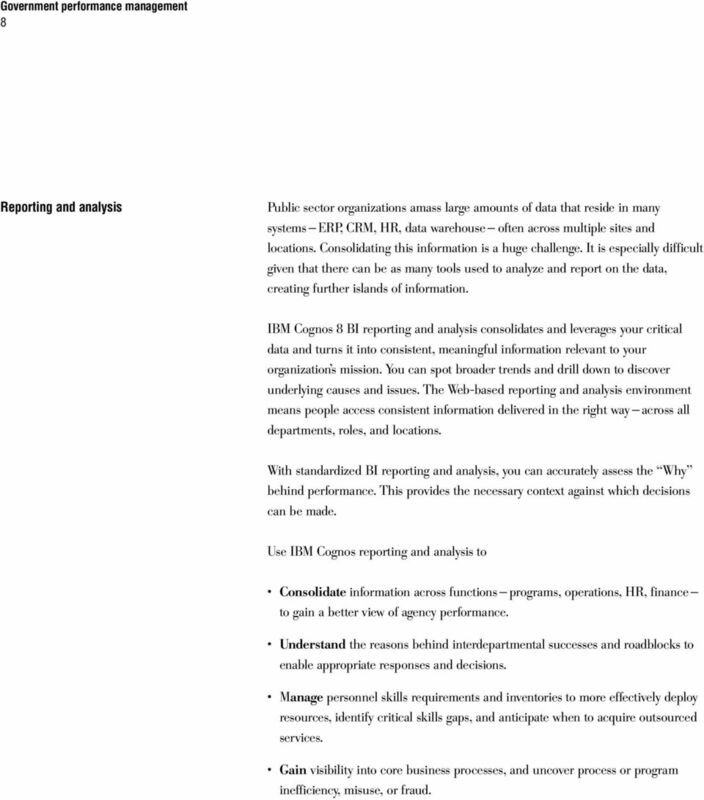 Use IBM Cognos reporting and analysis to Consolidate information across functions programs, operations, HR, finance to gain a better view of agency performance. Understand the reasons behind interdepartmental successes and roadblocks to enable appropriate responses and decisions. Manage personnel skills requirements and inventories to more effectively deploy resources, identify critical skills gaps, and anticipate when to acquire outsourced services. Gain visibility into core business processes, and uncover process or program inefficiency, misuse, or fraud. 9 9 Share timely information with legislators, other levels of government, the business community, regulatory authorities, and private citizens. Deliver accurate and consistent reports, even in complex compliance and quarterly reporting environments. Customer success: U.S. Coast Guard The U.S. Coast Guard was recently recognized for the successful implementation of its Aviation Logistics Management Information System (ALMIS) initiative, which makes use of IBM Cognos business intelligence. The U.S. Coast Guard s win marks the third consecutive year that an IBM Cognos customer has received a Technology ROI award. The ALMIS project was designed to consolidate disparate flight operations data including flight itineraries, aircraft status, maintenance, logistics and supplier information into a single system, thereby eliminating duplicate data entry, reducing system downtime, and facilitating information access. By leveraging IBM Cognos business intelligence, the Coast Guard is able to improve visibility into its supply chain; enable transparent data access and facilitate report generation for its air station personnel; and significantly reduce the costs of its aircraft parts requisition process. According to Nucleus Research, this has translated into $5.2 million in annual savings from reduced system downtime. A one-time savings of $3.5 million through streamlined warehouse inventory controls. $500,000 in annual savings from the prevention of requisition reorders. $2.4 million in annual savings from improved parts forecasting and availability. 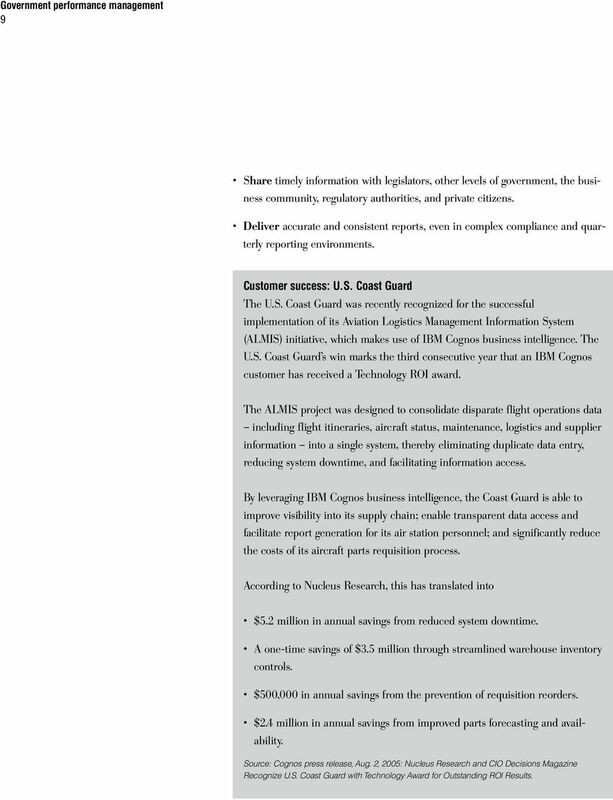 Source: Cognos press release, Aug. 2, 2005: Nucleus Research and CIO Decisions Magazine Recognize U.S. Coast Guard with Technology Award for Outstanding ROI Results. 10 10 Planning and budgeting Many departments still use spreadsheets as their primary vehicle for planning, budgeting, and reporting. Spreadsheet-based systems create islands of financial and planning data, where everyone works independently. This disconnected approach does little to support management goals, cross-functional collaboration, or the dynamic planning cycles needed to address changing conditions or requirements. What s required is a solution that replaces a fragmented process with continuous, collaborative planning that delivers up-to-date insight into government performance. 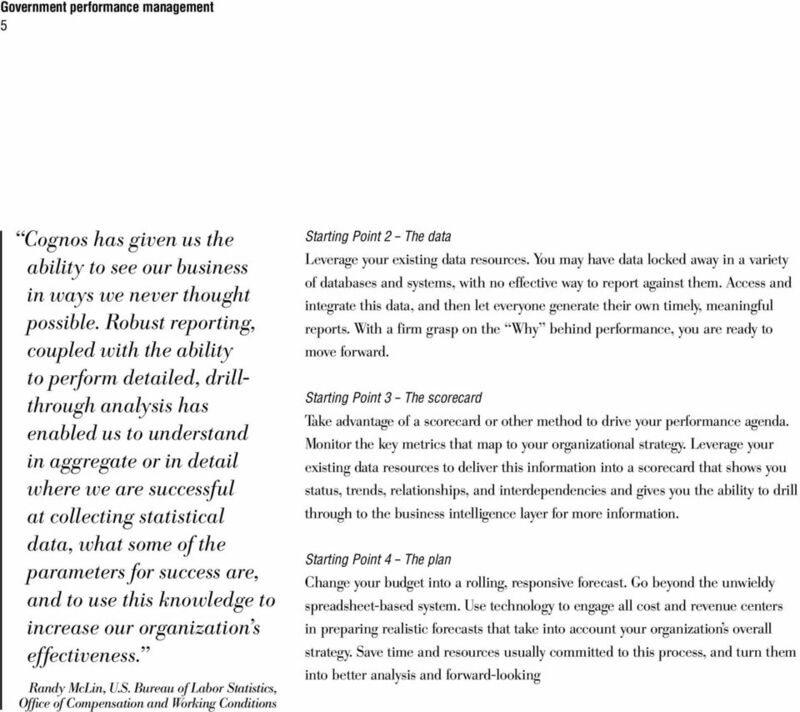 IBM Cognos 8 Planning helps you build a foundation for higher performance by connecting strategy to plans, targets, and operational objectives. The American people should be able to see how government programs are performing and compare performance and cost across programs. The lack of a consistent information and reporting framework for performance, budgeting, and accounting obscures this necessary transparency. The President s Management Agenda IBM Cognos 8 Planning addresses What should we be doing by allowing you to define goals, and turn them into discrete plans and budgets for the entire organization. Plans can be built to maximize operational effectiveness, and they can be realigned as conditions change. 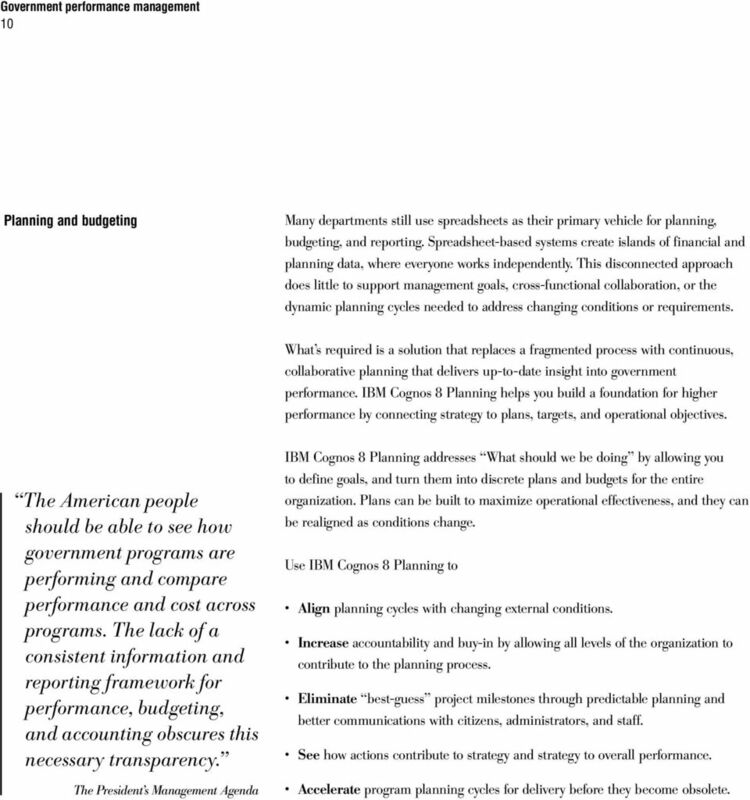 Use IBM Cognos 8 Planning to Align planning cycles with changing external conditions. Increase accountability and buy-in by allowing all levels of the organization to contribute to the planning process. Eliminate best-guess project milestones through predictable planning and better communications with citizens, administrators, and staff. 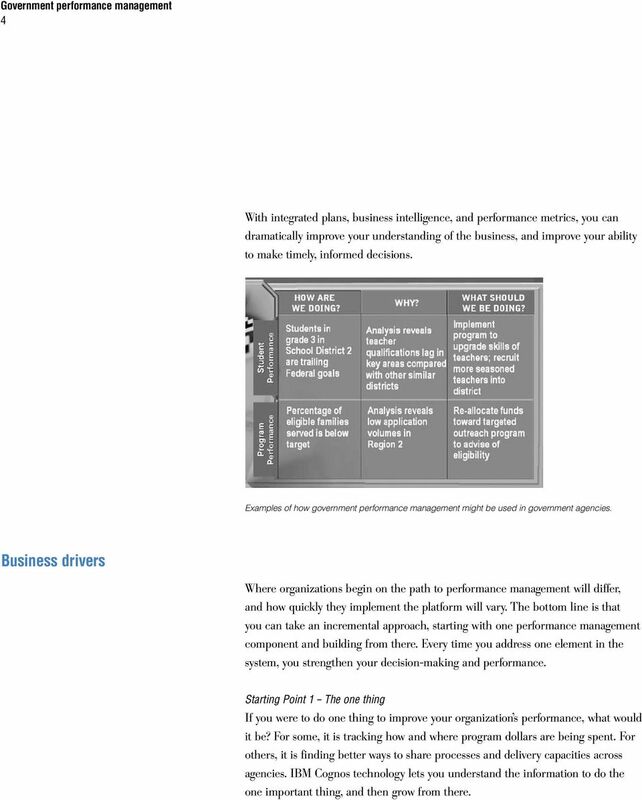 See how actions contribute to strategy and strategy to overall performance. Accelerate program planning cycles for delivery before they become obsolete. 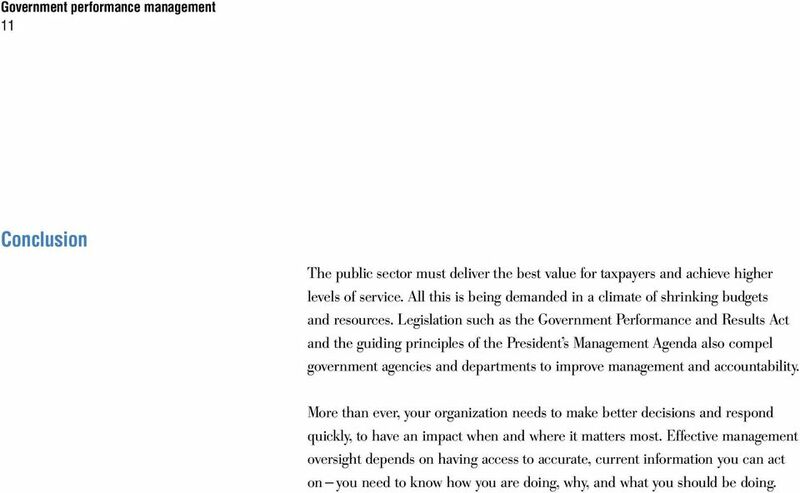 11 11 Conclusion The public sector must deliver the best value for taxpayers and achieve higher levels of service. All this is being demanded in a climate of shrinking budgets and resources. Legislation such as the Government Performance and Results Act and the guiding principles of the President s Management Agenda also compel government agencies and departments to improve management and accountability. More than ever, your organization needs to make better decisions and respond quickly, to have an impact when and where it matters most. Effective management oversight depends on having access to accurate, current information you can act on you need to know how you are doing, why, and what you should be doing. Key Performance Indicators should work for you, not the other way around!